40 PTS Jobs available in Andhra Bank Ludhiana Zone. Selection for Part Time Sweepers jobs will be through Written Exam or Interview. Those who are looking for this kind of Jobs then apply for Part Time Sweeper Jobs of Andhra Bank on or before 05-02-2018. Application form is available for download in Official Website of Andhra Bank www.andhrabank.in. Download the application and fill the details and submit the application form in given address of Ludhiana Zonal Office. 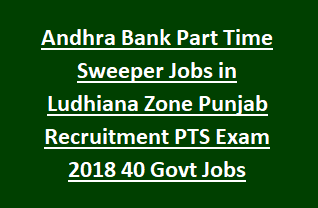 Qualifications, Age limits, Salary and other details of Andhra Bank PTS Part Time Sweepers Recruitment information is given below. Last date for submission of application form submission is 05-02-2018 . There are total 40 PTS vacancies in this Andhra Bank Part Time Sweeper Jobs Recruitment. Age limits for PTS Jobs of Andhra Bank for General Candidates 18-25 Years. For SC/-ST-Maximum age limit is 30 Years. Must have qualified 8th class. Candidate should have studied Local Language up to 8th class. Selection for this vacancies will be through written exam or through personal Interview. If exam is conducted syllabus will 8th class level only. Those candidates who are will to work with Andhra Bank as a Part Time Sweeper then can download application from www.andhrabank.in and fill all information in given fields. Attach all self attested documents of TC/School Leaving Certificate, Nativity Certificate, Study Certificate, Educational Qualifications, Caste Certificate, ID and Address Proof and any other required documents. Submit the application form by hand @Andhra Bank Ludhiana Zonal Office.